Sweethearts, the conversation candy hearts we all loved in grade school, will be MIA this Valentine’s Day after the original producer went out of business last year. Until July 2018 left Necco in a financial mess, that is. According to Market Watch, the company abruptly shut down after an investment firm bought it from a bankruptcy auction. In September, the company was revived when it was bought by Spangler Candy Co., but by then, it was too late to re-start production and distribution in time for Valentine’s Day. So, when will the tasty treats be back on the market? According to Spangler Chairman and CEO Kirk Vashaw, the candies could be making a comeback by 2020. “We are looking forward to announcing the relaunch of Sweethearts for the 2020 Valentine’s Day season,” Vashaw said in a statement. 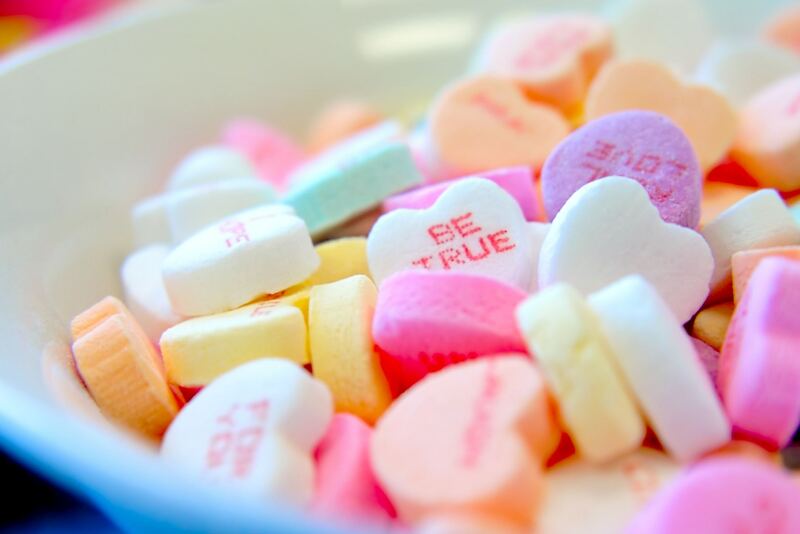 The Sweethearts brand makes up nearly 80 percent of the conversation-heart market, reports CandyStore.com, with approximately 19 million pounds sold each year! What’s more? Conversation hearts beat heart-shaped boxes of chocolate as the most popular Valentine’s Day candy sold in the U.S. for two consecutive years. Where can I buy Sweethearts candy? Brach’s not only sells Tiny Conversation Heart candies with flirty sayings (i.e., “Crazy 4 U” and “One & Only”), but the brand also offers a variety of Conversation Heart recipes, like Conversation Heart Sugar Cookie Bars and Conversation Heart Whoopie Pies. These may be a bit sour, but who knows? You might like it! Scripture Candy Inc. is exactly what it sounds like. The company sells faith-based conversation hearts inside of a packet that "features a scripture verse, a love message, a 'To: / From:' signature area, and a unique reference from John 3:16." Please note: If you do happen to find a bag of Sweethearts in the store, just keep in mind that the candies inside were produced prior to July 2018!